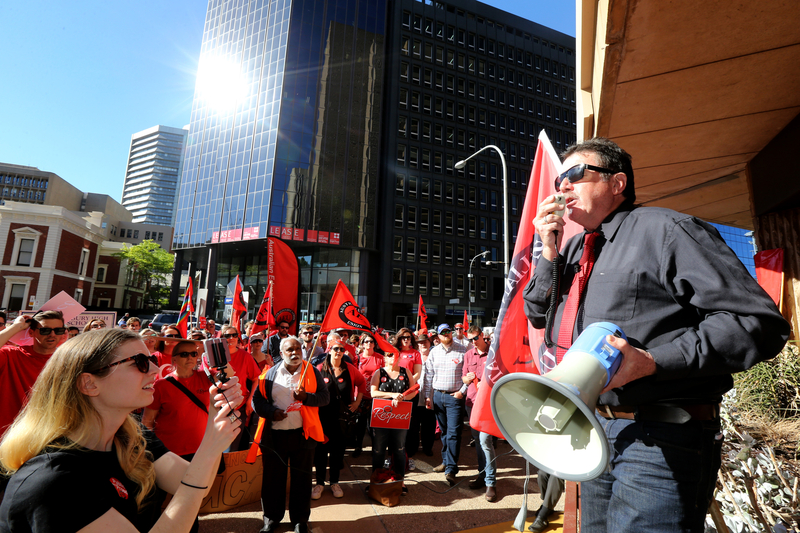 Now that South Australian school teachers have voted to strike, it would be a great time to actually explain their specific demands to the public, writes Tom Richardson. In his victory speech to the rapturous Labor faithful after coasting back into office in Saturday’s election, Victorian Premier Dan Andrews made a point of thanking the trade union movement. It’s likely, if Steven Marshall has occasion to deliver a similar speech in three-and-a-bit years’ time, that the SA Premier won’t make a similar acknowledgement. After all, despite all Marshall’s lip service about friendly relations with the unions, industrial action appears to be de rigueur in the early months of his administration. Parents around the state are today finding out whether they have to make alternative arrangements for Thursday morning after teachers overwhelmingly voted to strike. While in other news, the Public Service Association is ratcheting up its industrial campaign after its enormously successful bid to win over public sympathy with its September stop-work action. Thursday’s half-day Education Union protest will be the state’s first teachers’ strike for a decade. 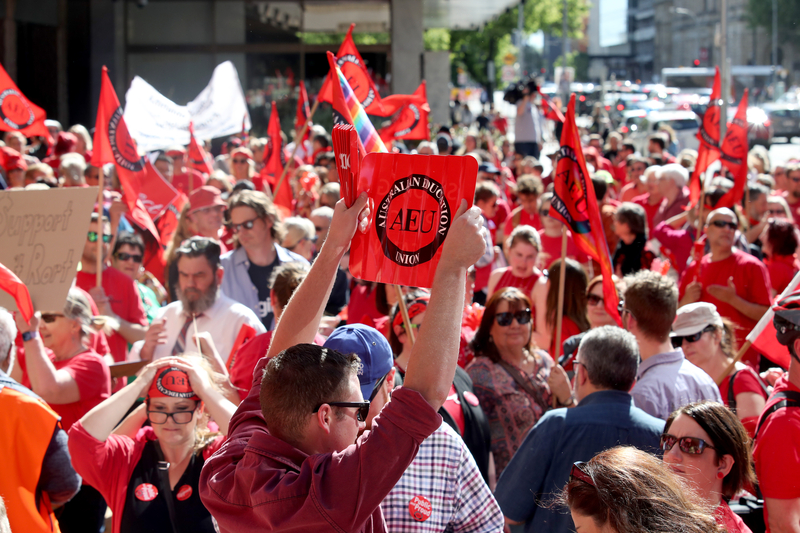 Back in 2008, under Correna Haythorpe (now the AEU’s national president), the union built its case publicly over several months, keeping South Australians informed, via the media, of the enterprise bargaining negotiation progress – or lack thereof. Thus, by the time industrial action was overwhelmingly endorsed, it was broadly seen as a logical inevitability, and the public – and parents, in particular – were widely on-side with the teachers. Teachers, after all, are a sympathetic profession. They educate and take care of our kids, and I’m all for them having the best available resources and conditions to do that – and for their right to fight for those conditions. All I’m saying is, now that SA’s teachers are officially striking again, it might be a great time to actually explain, y’know… what specifically they’re striking about? Because the thing is, with this particular round of industrial action, I’m a bit lost. I’m not against it, mind you. I’m not bothered about making alternate arrangements for the morning, although I’m sure many will be. But it makes as much sense to me as one of those many “pupil-free days” that randomly pop up throughout the school year. You know there’s probably a perfectly good reason for them, it’s just that no-one ever really explains it to you, other than the obligatory “planning, training and development”. The rationale for this strike seems much the same. Indeed, when I first got wind of the strike ballot last week – not via the union but the school network – I contacted the union to see what was afoot. State president Howard Spreadbury confirmed to me that members were being balloted, but refused to elaborate. He wouldn’t even explain why the industrial action was being considered, and seemed to suggest he wouldn’t speak publicly until the vote was finalised. “I’m not going to comment at this stage – we’ll put something out when it’s determined,” he said at the time. Which evidently suggests he was content for parents not merely to be given just two days to make alternative arrangements, but to have no prior warning of the prospect whatsoever. This strategy, for want of a better word, changed pretty dramatically once the looming industrial action was leading that night’s news. At that point, the union leapt into action with a statement explaining that such a move is “never taken lightly” and noting that “negotiations by any government about changing conditions, resources and funding arrangements are particularly concerning” because their members’ workplaces were also “a learning environment for children”. It did not, however, explain exactly what the issues were that had prompted such drastic action. The next day, Spreadbury did the media rounds in more earnest, telling reporters the union had not notified the broader public about its intentions because it had not yet finalised its media strategy, but – never fear – it now had a media strategy, which it was busily rolling out. Thanks to which, we now know the AEU is “campaigning to reduce class sizes, improve funding and support for every child, let leaders focus on leading and ensure we get the support we need in country schools”, while the Government “wants to remove hard-fought conditions and funding safeguards”, which will – apparently – “hurt every student in every school”. Teachers also, I gather, feel “betrayed” that an item labelled “The Commitment” – which underpins various funding guarantees – is being withdrawn from the proposed enterprise agreement. I’ve sought more detail about the specifics of all this. For example, what is the cap on classroom sizes the union is demanding? What specific support measures are they calling for in country areas? “The Enterprise Agreement expired on 30 June 2018. The AEU was well prepared for negotiations with a document outlining 107 proposals to address a number of issues based on feedback from members. “The Marshall Government rejected over 100 of the proposals, only accepting a few minor proposals and also revealed the plan to remove ‘the Commitment.’ Removing this section from the Enterprise Agreement removes security of conditions, resources and funding which directly impacts on the learning environment for schools and preschools. “The AEU is asking for more teachers to be employed so that we can reduce class and group sizes. Our members are concerned about how class sizes are impacting on student outcomes. In their professional opinion, 96 per cent of primary teachers said class size impacted student outcomes, 96 per cent said class size impacted student behaviour, and 94 per cent said class size impacted their ability to be a more effective teacher. “In their professional opinion, 96 per cent of secondary teachers said class size impacted student outcomes, 97 per cent said class size impacted student behaviour, and 97 per cent said class size impacted their ability to be a more effective teacher. “The Department have proposed to remove the Commitment from the Enterprise Agreement. This commitment provides assurances that students with additional needs will receive adequate support and we are concerned that these students will not receive the support they need to be successful. It should be noted, though that The Commitment contains a preamble that makes clear it “will operate until the end of the 2018 school year, or until such time as the South Australian School and Preschool Education Staff Enterprise Agreement 2016 is revoked or terminated in accordance with the Fair Work Act 1994 (SA), or until such time as a new enterprise agreement is approved, whichever is sooner”. I’m sure teachers are convinced of the merits of their action – but thus far their union has not been convincing. As far as what’s been placed in the public arena to date, the whole thing has a distinctly ‘It’s the vibe’ aura about it. Back in ’08, the sticking point in long-drawn-out EB negotiations was the then-Labor government’s refusal to meet the union’s pay increase demands. This time round, they haven’t even got that far in the negotiations yet. So, while the current EB expired in June, it nonetheless seems a little premature for the union to be calling its first strike in 10 years. Strike action is a significant step – particularly when it creates so much collateral effect – and it’s important to take the community with you. The union did that in 2008. I’m not convinced they’ve done it this week. Before ’08, the last time they went down this road was all the way back in 1996. Few may remember that now, but Treasurer Rob Lucas presumably does – since he was the Education Minister at the time. I have it on good authority that a couple of days before the now-infamous Corrections-led stop-work protest in September, Lucas was enjoying a convivial post-Budget drink at the Members’ Bar in parliament when he was asked how he’d weather the looming backlash. Draped casually against the bar, Lucas assured his interlocutor that there was nothing to worry about – the unions would, by their very actions, ensure public sympathy was broadly against them, and there was every chance the protest would go off-script in some way to boot. Now, he didn’t need to be a political mastermind to work all this out, but even Lucas couldn’t have predicted just how accurate his prediction would prove to be. 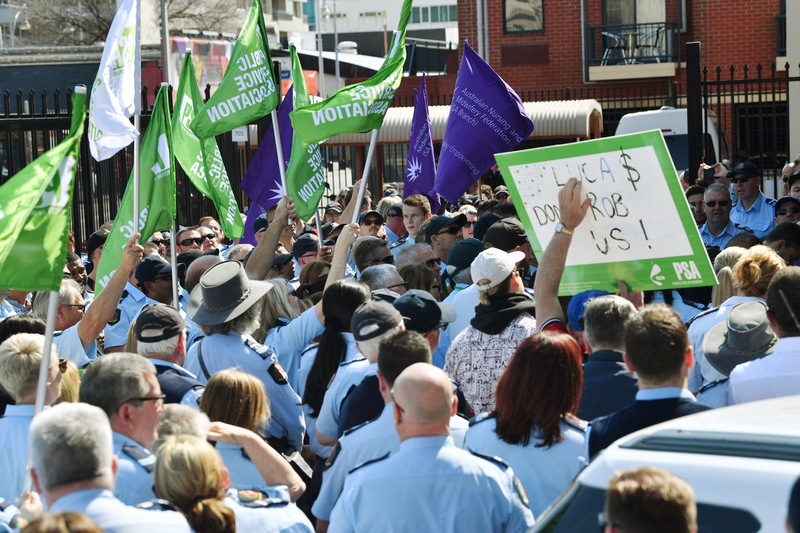 The September rally quickly got out of hand, with striking corrections workers storming the city watch house and laying into the poor fella manning the desk in their absence, whom they decried as a ‘scab’ in ugly scenes broadcast in news bulletins statewide. So while the Liberal Government may not exactly be making friends with the union movement, with enemies like these, who needs friends? The irony, of course, is that Lucas’s September budget made a selling point of its Education investment. In its haste to go to war, the teachers’ union risks making this action be seen as little more than a resumption of hostilities 16 years in the making. In Victoria, the self-anointed “most progressive state in Australia”, the union movement may be the darling of the man whose name is this week on everyone’s lips. But right now in SA, the trade unions are revolting – which is exactly what the Liberal Government expected them to do.